Every week we pull together some great Canadian recipes from Canadian food bloggers around the web featuring one main ingredient or dish. This week, we're getting stuffed - we've collected 10 delicious holiday stuffing recipes from our members just in time for holiday entertaining! Stuffing... would Thanksgiving exist without it? Yeah, it would. But it wouldn't be as tasty! Stuffing can be cooked in the bird or even as a side dish. You can make it vegetarian or vegan friendly - in fact if you're entertaining vegetarians, vegans or people with food allergies this holiday season, be sure to check out our Allergen Friendly Recipe Remix for Holiday Stuffing! 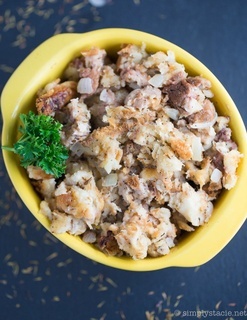 **[Cornbread Stuffing With Salt Pork](http://outlanderkitchen.com/2015/11/10/cornbread-stuffing-with-salt-pork/)** from **Outlander Kitchen**. **[The Best Stuffing Recipe Ever](http://www.theendlessmeal.com/the-best-stuffing-ever/)** (you know you've got to test that claim!) from **The Endless Meal**. **[Stuffing Traditions](http://www.alishaenid.com/2014/12/16/christmas-dinner-traditions-stuffing/)** with **Alisha Enid**. **[Bacon Wrapped Stuffing](http://joandsue.blogspot.ca/2013/12/bacon-wrapped-stuffing.html)** from** Jo and Sue**. **[Sourdough Stuffing](http://www.livinglou.com/2015/10/sourdough-thanksgiving-stuffing.html)** from **Living Lou**. **[Gluten Free Stuffing](http://www.officiallyglutenfree.com/2015/10/gluten-free-stuffing/)** from **Officially Gluten Free**. **[Homemade Turkey Stuffing](http://www.thebewitchinkitchen.com/homemade-stuffing/)** from **Bewitchin' Kitchen**. **[Sausage Stuffing](http://www.mykitchenlove.com/essential-thanksgiving-side-dishes/)** from My Kitchen Love. **[The Veggiedukken](https://dishnthekitchen.wordpress.com/2015/11/13/thanksgiving-everyday-veggiedukken/)** from **Dish n the Kitchen**.